How many of you read the title of this post and said, “Oh Directrice, you had me at To-Sew”? For those who are baffled, an explanation shall be provided forthwith! Alternate titles for this post were The Directrice Gets Weirder (Part I) and Heart of Darkness. January — the month when most people turn over a new leaf by re-embracing exercise, a healthy diet or some other personal improvement regimen — appears to be the month when I descend to a new level of sartorial eccentricity. Do you remember what happened last year? Allow me to remind you. This, this, and this happened. Why is this? I have a few theories. Theory 1: Year-end reflection leads to the realization that one cannot rely on external validation for feeling of self-worth and must instead internally promote oneself, which temporarily leads one to believe — among other things — that one can fly. Theory 2: Year-end reflection leads to the realization that we only go around once in our lives, which reminds one that it is important to find beauty, amusement, and delight in even the small gestures. Theory 3: If the year is a successful one at work, there are little indulgences commensurate with that success. Theory 4: All the weird, unsalable merchandise from the year appears in post-Christmas sales and when it’s all shown together, it looks relatively normal. Theory 5: The weird, unsalable merchandise on offer in the post-Christmas sales isn’t obscured by thousands of pieces of normal-looking clothes and thus is easier to find. Come closer and look at this turtle-shell — I mean, directional felt top — by Commes de Garcons on The RealReal. Did you notice the fins? For those who want to take a closer look at my brooch, be my guest. 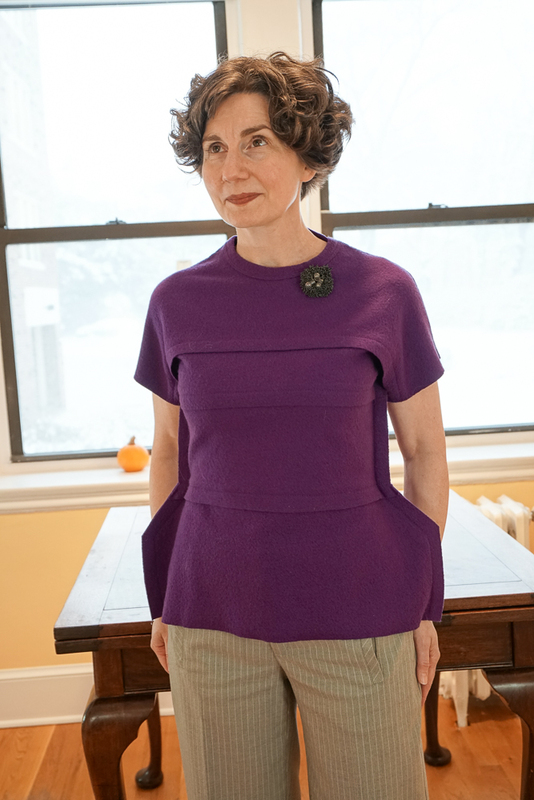 So many things to love about this top: the color, the material (felted wool), the blatant construction, the super-structure it imposes on top of own silhouette. 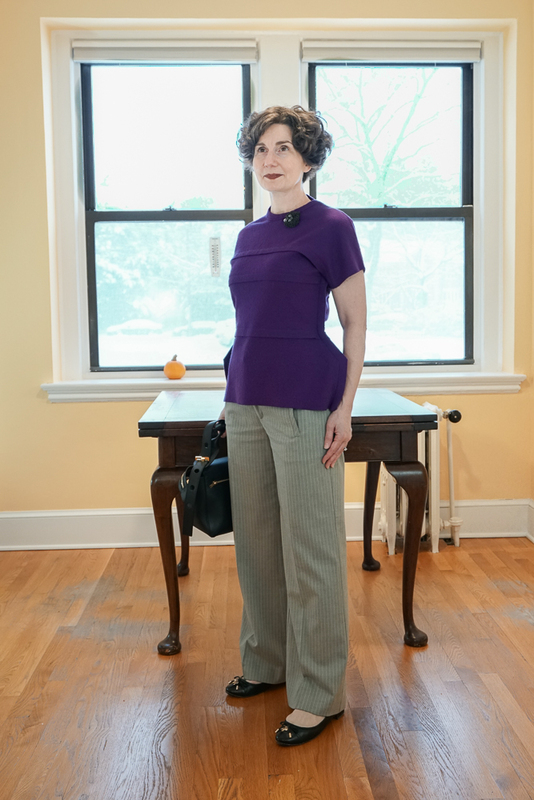 This top was too big for me (too long and loose through the sleeves) and so I asked Fatima to take it up along the shoulder seams. We decided to modify the design just a bit and remove the excess seam allowance (which showed and looked like a spinosaurus’s ridge) to create a smooth line along the shoulders. Fatima did create a modest ridge around the back of the neckline to honor the spirit of the original design. The construction is not simply a contemporary delight for me. It generates a warm feeling of nostalgia for my seventh grade home economics class. ** Our sewing project was to make a whimsical throw pillow, chosen from one of several design kits manufactured by a company called To-Sew. The sewing was mostly simple appliqué work using felt. The most popular design was . . . a hamburger. I made a hot dog. There were animal designs, too, and I think all of the animals had buckteeth. I found these kits on eBay. The fact that one of the choices is a cell phone tells us that To-Sew was still dominating this field in the early 00s. So please, if you remember To-Sew, share your memories. And if you didn’t learn or develop your sewing skills with To-Sew, please share a description of your best Home EC project. * The acquisitions happen between December 20 and January 21 but sometimes do not roll out on this blog until later. ** To put my Home EC class in proper context, the year was 1982-83 and my junior high school offered 7th graders three choices: a full year Home EC curriculum, a full year Shop class, and a year divided between the two. I did the hybrid class (thank you, Mom and Dad!) although most girls did not and only a couple of boys (maybe 3?) joined us. Congratulations on both the work success and the little indulgences. I think this top is gorgeous. Also, may I suggest another miniseries? All the above-linked January weirdnesses of recent years, re-worn in 2019… I looked at them all. My favourites, in no particular order, are the pink shark mouth, the yellow shell, and the not-sheath-dress. But all are spectacular. My favorites: the yellow Marni top with the exaggerated bow and the pink Star Trek uniform top! A question: do all these lovelies get worn throughout the year? Interestingly, the Big Tent gets the most wear. I find that colossal shirt rather versatile. And the Weight Securing System belt is worn often. I hesitate to tell you, but I returned the Marni top; the tags were still attached in that photo. I decided that it was too strange even for me. The pink top has only been worn once so far, so perhaps it needs to return to the office in February! Oh dear, the Marni top was by far my favorite. But maybe my love was for the color and texture. The top does appear to have limited uses. I must say — as the mom of two dinosaur-obsessed boys — the reference to a spinosaurus in this post brings me great joy. Also, I adore your purple top with fins. And I agree with Jessica: the Directrine’s loyal readers need to see past years’ January weirdness once more. In 8th grade home-ec I made a patchwork, bias-cut maxi skirt and a baked Alaska. What can I say? It was the early Seventies. The Home Ec pillows! 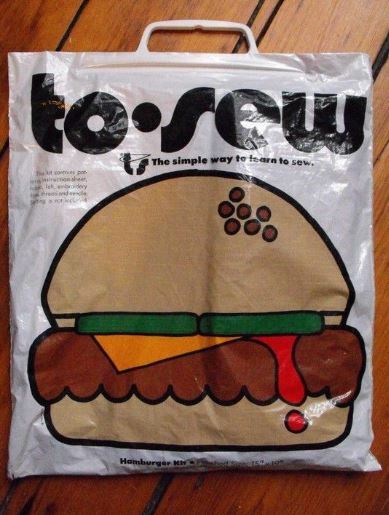 I made the hamburger in the late 1980s and am now wondering what ever happened to that pillow. I also recall making a pot holder and an apron, both of which my mother still has some 30 years later. 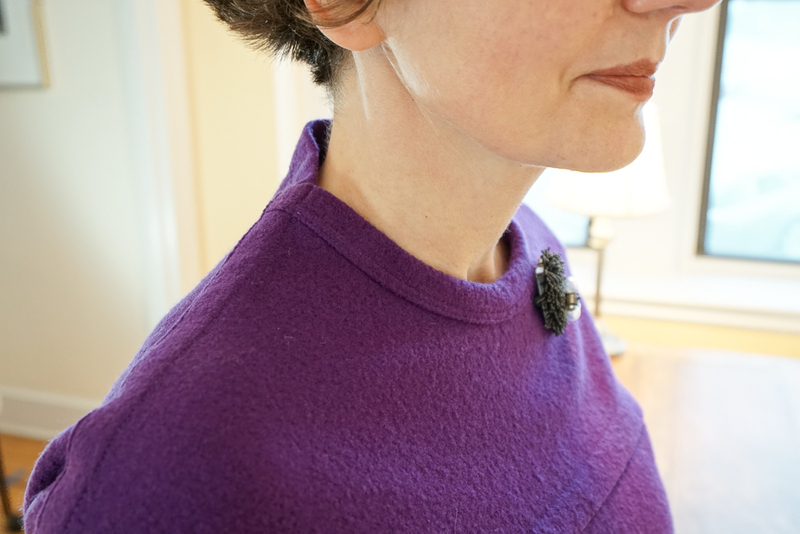 The purple color of the top is lovely and is just the thing to brighten up January. 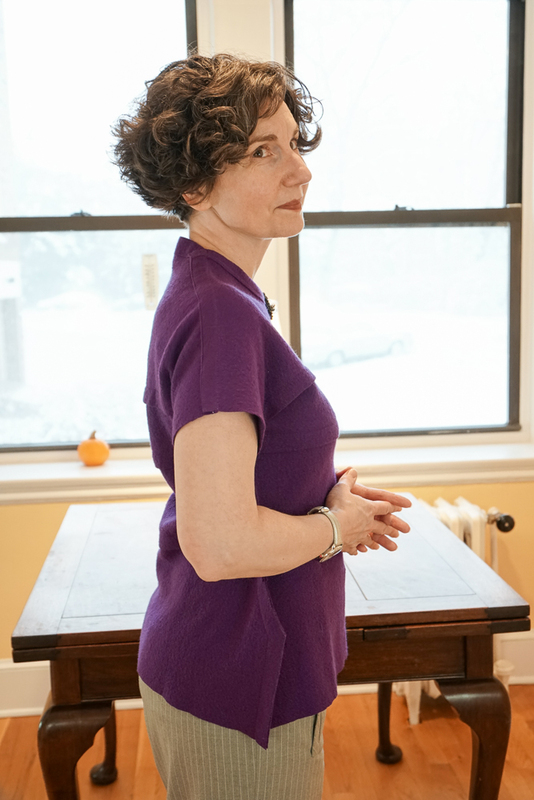 I made an olive green a-line skirt and creme of cauliflower soup. Loved both! In 8th grade Home Ec class, I (accidentally) sewed the apron I was making to the skirt I was wearing that day. And I never mastered threading the bobbin on sewing machine. Cooking class was worse. Sadly, in that era girls were only allowed to take the cooking and sewing classes, not the more interesting ones the guys got to do. 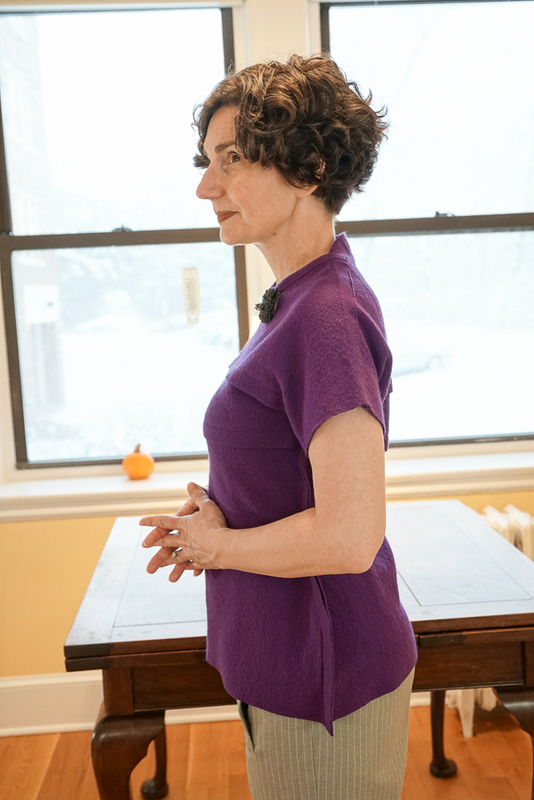 I made a long-sleeved pink blouse with french cuffs, and creamed onions. Hated both. Does this top have fastenings? How do you get it on? Is it stretchy? I took Home Ec in the late ’70s and to this day it remains one of the most useful classes I ever took (second only to typing). I remember lots of kitchen tips, knitting and sewing, but the most enduring are the felt Christmas tree ornaments we made, with glue and blanket stitch. I still put a few on the tree some years. The top has no fastenings, Amy. It pulls on over the head. 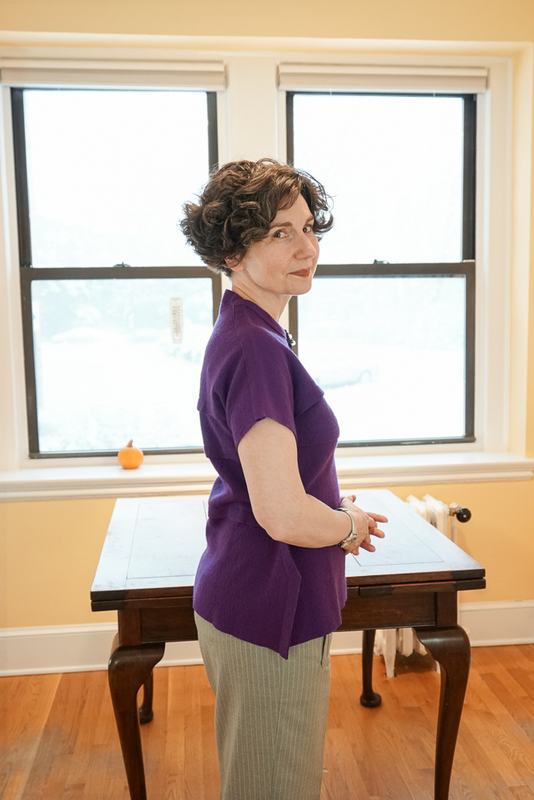 The fabric stretches — not as much as a sweater, but enough to comfortably pull it on and off. Fatima did take care to make sure that her alterations would not reduce the circumference of the neck so much that I could not do so — which another tailor once did do. Home Economics 1981-1986 brought me to sewing – and I’ve sewn ever since… drapes, cushions, Halloween costumes and articles of clothing I must have and cannot find in stores. The cooking section of Home Ec? Complete and utter failure, however I do enjoy eating and can thoroughly appreciate someone else’s fine cooking. Your purple top is adorable. I love this! Modern-day version of those queens who were forced to walk sideways through doorways due to the dramatic and showy width of their gowns. I hope you dance a minuet with the Photographer. I dig the ever so slight cape-ness to it. Oh no. I mean, it’s one thing to have a nice mother teach you clever things about dressing to advantage but something else to have a teacher teaching you that you are a flawed creature. I can’t even imagine the teacher’s lessons plans! It was a different era (yours and mine). AND NOW WOMEN ARE TAKING CONTROL. My home etc adventure stars Miss White, a prissy over-caffeinated home ec teacher in my small country school. I made a plaid smock, which required me to match the bias-cut plaids at the side seams. Since I was an accomplished 4-H sewist who had taken reserve grand champion at the county fair with a double knit polyester minidress (early ‘70’s) she found it necessary to hover over my work, ultimatey giving me a “C” on my smock due to the misalignment of one errant seam. I ended up switching completely away from clothing construction (too fiddly) to quilting (wha?) which I enjoy to this day. Miss White, for some reason, and her tight curled hair, cat eye specs, and clicky block heels remains seared into my memory, along with Mr. Jones the math teacher ( known affectionately as “Bear”because of his size and the way he walked), who seemed to be very good friends with Miss White. 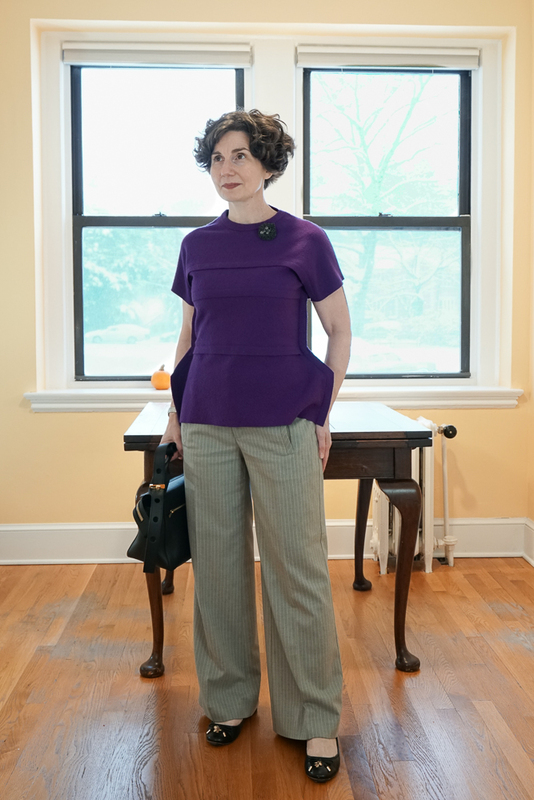 Wow, I really love this top, especially how the flange at armhole level is so elegantly tailored to the body, in contrast to the one at the hip which is so angular and unnatural. 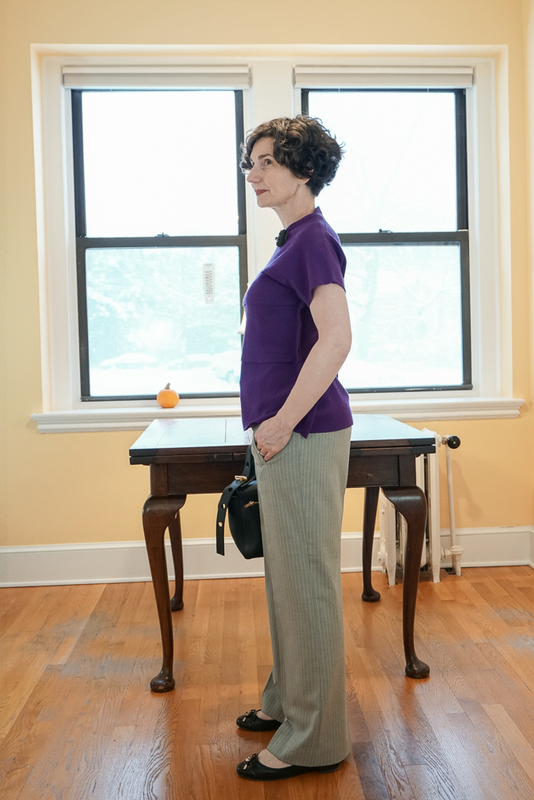 The fit in front is beautiful the back makes me want to add one more tuck at waist level to get rid of that wrinkle (but who really cares about backs). This purple top thing is just amazing and so right up my alley between the color, the fins, and the clever clever layers. Is it from that 2012 Flat Pack collection?